Nutrition is important to think about for all of us, as what we eat gives us energy, feeds our cells, nourishes our brain and participates in so many vital life functions. In thinking about childhood, a time of rapid growth, maturation and brain development, this gives nutrition even greater importance. For parents of children with ADHD, nutrition can be critical in helping to manage symptoms of hyperactivity, inattention, lack of concentration, impulsivity and oppositional behavior. Most modern diets are filled with foods whose ingredients are a laundry list of artificial additives, chemicals, colors and preservatives. These foods are grabbed due to their convenience, taste and often their price. Many of the additives, however, can aggravate allergies and sensitivities that manifest in adverse ways such as digestive issues (bloating, stomach upset), headaches and rashes. Some studies have shown that certain food colorings and preservatives may increase hyperactive behavior in some children. Food additives that may increase hyperactive behavior include: Sodium benzoate, FD&C Yellow No. 6 (sunset yellow), D&C Yellow No. 10 (quinoline yellow), FD&C Yellow No. 5 (tartrazine) and FD&C Red No.40 (allura red). While other countries, such as the U.K., have either banned the use of artificial dyes from their food products or require clear labeling as to the type of additive and its purpose for being in the food, the U.S. Food and Drug Administration (FDA) only requires labeling of FD&C Yellow No. 5 on food packaging. So how do you avoid feeding your children (and yourselves) these artificial ingredients? In an ideal world, we would all eat fresh food straight from the farm. Since this is not realistic, however, prepare as much fresh, unpackaged food as possible. When you do buy foods that come in a bag or a box, read the ingredient labels to make sure you can pronounce and recognize everything listed (if it sounds like it was made in a lab, it probably was). The American Heart Association recommends no more than 3 to 4 teaspoons of sugar per day for children, yet the average child consumes 32 teaspoons per day. There are many problems associated with eating too much sugar — diabetes, heart disease, obesity, thyroid disease, (the list goes on). In children with ADHD, the highs and lows associated with eating too much sugar can aggravate everything from energy levels, to irritability, attention span and hyperactivity. There are some strategies that can help keep your child’s blood sugar levels stable. While your child needs sugar in the form of carbohydrates to fuel their body, these carbohydrates should come in the form of fresh foods versus nutrient-deficient, packaged ones. Added sugars tend to go hand-in-hand with eating processed foods, with the biggest culprit in the form of high fructose corn syrup (HFCS). So minimizing processed foods in your home is again a huge help. For any packaged foods that are purchased, stick to those without HFCS and no more than 10 grams of sugar per serving. Note that food companies can be deceptive in their marketing strategies to encourage you to purchase their products. A prime example is that for yogurt, Greek or otherwise. While touted as a healthy source of protein and calcium, the average yogurt contains 26 grams of sugar – with 14 grams of those as added sugars. In other words, one container of yogurt contains basically the entire recommended daily allowance of sugar for your child. Another general rule to stabilizing blood sugar is to stay away from the white stuff (white bread, white rice, white pasta, white potatoes) as these simple carbohydrates break down into sugar and release into the body just as quickly. Whole grains, fruits and vegetables should make up the majority of your child’s carbohydrate sources. The natural sugars from these foods are released into the bloodstream in a more gradual and sustained manner due to them being packaged alongside fiber. Next, include foods rich in protein in your child’s diet. These can come from vegetable sources (beans, legumes, nuts, seeds, quinoa) or animals sources (eggs, dairy, fish, lean meats). When choosing animal sources, try to purchase from reliable sources free of antibiotics and hormones. Finally, make sure your child has a couple healthy snacks in case they do get hungry. Some great options comprised of protein, healthy fats and carbohydrates include almonds, sunflower seed butter and an apple or hummus and vegetables. Omega-3s (and their counterparts the Omega-6s) are essential fats important for normal brain function. Since our bodies cannot produce these fats, we must get them from our diet. While both fats are vital to health, studies report that children with ADHD have lower blood levels of omega-3’s than those without ADHD. There is already information on the site about the importance of omega-3 fatty acids in improving the symptoms of ADHD, so I will not focus too much in this post other than to say that omega-3’s are an important part of your child’s diet as they have been shown to improve several aspects of ADHD behavior. So how do you make sure your child gets enough omega-3s in their diet? Include sources such as nuts (walnuts), seeds (flax, hemp, chia, pumpkin), flax oil, avocados and fresh (wild-caught) fish. Even green vegetables and herbs like Brussels sprouts, kale, spinach and watercress, mint and parsley contain omega-3s. To fully ensure sufficient consumption of omega-3 fatty acids, additional supplementation in the form of capsules or liquids can also be helpful. Liquid omega-3s can easily be mixed into smoothies (and I have one recipe below for you). Most people think that you need to have an immediate reaction and medical diagnosis for a food to impact health. In truth, traditional allergy tests only detect antibodies associated with more severe allergies and often come back negative for people who have food sensitivities, such as those often seen in kids with ADHD. A number of research studies have shown that many children who do not exhibit classical, severe and immediate allergies are actually sensitive to certain common foods in the diet. When eaten, these foods can cause subtle symptoms that could easily be overlooked but aggravate ADHD symptoms. The best way to determine if your child has any food sensitivities is to do what is called an elimination diet, where suspect foods are removed from the diet for 2-3 weeks at a time and you observe whether ADHD symptoms improve. In addition, keep an eye on other symptoms such as asthma, eczema, hayfever, headache and gastrointestinal (stomach) problems. The most common culprits are dairy, wheat and soy – along with the food additives mentioned above. While all of these dietary changes can seem overwhelming to implement, they can be done one step at a time and there are many resources available to help support you. Hopefully we will be a good source for you here. 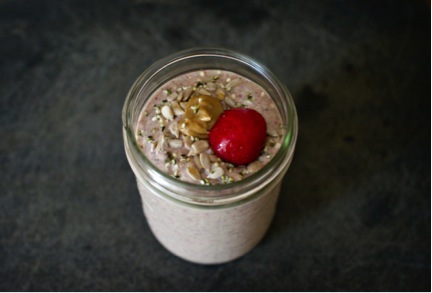 A great breakfast or snack, the SB&J Smoothie provides a good balance of protein, healthy fats and carbohydrates. It is rich in omega-3 fats, fiber, B vitamins and vitamin C. All this and only a moderate amount of sugar, all from natural sources in fruit. This smoothie works well even during an elimination diet as it does not contain any of the common allergens. Place all ingredients into blender and blend until smooth. Depending on consistency desired, you can either add ice to thicken or a bit of water (or more almond milk) to thin out. 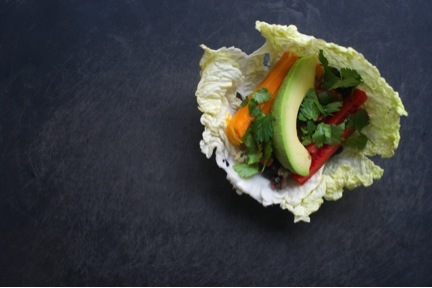 One of my personal favorite ways to eat sandwiches without bread is to create wraps using cabbage, lettuce, chard or collard greens. By using greens as wraps, you can avoid gluten (a potential allergen) and minimize the sugar surges associated with high carbohydrate, low fiber meals. They are easy, fast and make for a good way to use whatever you might have in the fridge – limited only by your or your child’s imagination. For this version, I included my favorite quinoa salad, baked sweet potato, black beans, avocado, red bell pepper, salsa and cilantro. These wraps again provide a good balance of protein, healthy fats and carbohydrates. They are rich in fiber, omega-3 fats, beta-carotene, B vitamins and vitamin C.
1. Add quinoa to a pot with water. Bring to a boil, then turn down to low and simmer covered for 15 minutes. Fluff with a fork and let cool for at least 5-10 minutes. 2. Transfer to a bowl and mix in the remaining ingredients. Serve warm or cold. Note: Some people soak quinoa to reduce the chance of digestive issues. You can put quinoa in a bowl with 1 cup of water and 1 tsp apple cider vinegar, cover and soak 12-24 hours. Prior to cooking, strain quinoa and rinse well until the water runs clear. 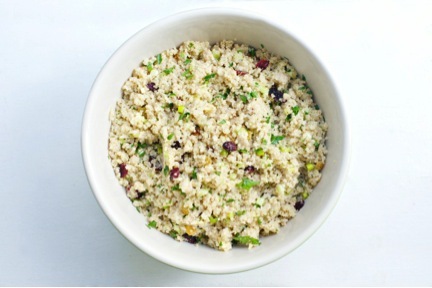 You will need to reduce water to 1 or 1½ cups as the quinoa will require less cooking liquid after soaking. Another trick to help reduce digestive issues (and add nutrients) is to place a thumb-sized piece of kombu (seaweed) into the pot while quinoa cooks. It is then removed prior to serving or including into a recipe. Also, the listed add-ins can be switched up or omitted for variety or if your child is sensitive or does not like certain items. For example, you could switch up the pumpkin seeds or other nuts for the almonds, or dried cherries or dates in place of the cranberries. Have fun trying out different combinations. Jocelyn Weiss, PhD MPH is an epidemiologist and health coach based in New York City. With passions deeply rooted in public health, nutrition and photography she created the blog An Unprocessed Life. Dr. Weiss believes that whole, unprocessed foods have nutrients that help to repair our bodies, provide us with energy, and support our immune systems. Her hope is that by showing others the benefits of eating unprocessed, along with being active and living well, people will feel empowered to take ownership of their health to prevent and reverse disease. You can see more ideas, recipes, and pretty pictures by following Jocelyn on Facebook, Instagram, Twitter and Pinterest.